Odboso PhotoRetrieval is a photo recovery tool that restores all corrupted and deleted photographs or the ones that were lost due to hardware malfunction. This utility works even if a memory card was re-formatted, Support JPEG, TIFF, BMP, CRW, NEF and more file format. You can see recovered images with the free trial version. After the program is purchased, you can save the images to your hard-drive. 100% Success Rate. Odboso PhotoRetrieval is a data recovery program that will recover digital camera photos that have been lost due to deletion, format, or media card corruption. The program supports hard-drives, external drives, cameras and flash memory devices such as Smart Media, Compact Flash, Memory Stick, MicroDrive, xD Picture Card, Multimedia Card, Secure Digital Card, and many others. 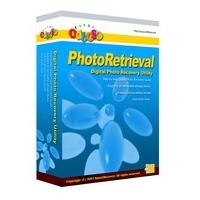 - Step by step Digital Photo Recovery Guide. - Supports all removable storage device. - Preview photo's larger preview, size and resolution before recover. - Floppy disk, Zip disk digital image recovery. - Polaroid, Sigma and almost all digital camera brands in the market.